I know it feels like we’ve been in Iceland forever, but in realtime, it was only a week (ha!). My Icelandic adventure ended a bit anticlimactically… with a 16-hour stay in the airport. My brother’s flight home was in the morning, and since we only had one car, we went together to the airport around 8:30AM. I had chosen Poland as my next destination, and the cheapest flights there were overnight flights leaving at 12:30AM. And so, that’s how I found myself sitting on a bench in the airport, throwing back mini chocolate chip muffins like they were popcorn, pretending to get work done, and trying not to have to go to the bathroom (because then you have to get up, lose your seat, and haul all of your crap with you. I maintain that this is the worst part of travelling alone). Is it weird that I really don’t mind spending a lot of time in airports? I did actually manage to have a productive day, and when it was time to go through security, I was surprised at how quickly the hours had passed. I even had the insane thought that I wouldn’t have minded a few more. That can’t be normal. The flight from Iceland to Warsaw, Poland is about 4 hours, and I spent all four of them completely unconscious. My eyes were closed from the instant I sat down until we pulled into the gate in Poland. As you might imagine, I wasn’t exactly feeling fresh when I woke up. Unfortunately, it was only 6:30AM, so there were still a LOT of hours standing between me and bedtime. I took my time leaving the airport. I like giving myself a moment to get oriented and washing my face and brushing my teeth before facing a new country. When I was feeling slightly more like myself (and slightly less like a zombie), I grabbed my bags and set off to find the bus into the city. It ended up being super easy to find and figure out… which leads me to my next list of first impressions! This guy is buying his bus ticket! The buses have machines where you can buy a ticket when you get on (and you can change the language to English!). Or, if you already have a ticket, you can validate it using the yellow box to the left. Public Transportation – SO easy to figure out and SO inexpensive. The buses announced every stop which is something I have come to appreciate because there’s nothing worse than being on a bus with no concept of where you are or where you’re going. Money – WHY SO MANY COINS??? My wallet weighed a ton because THERE ARE SO MANY COINS. Their “dollar” is “złoty”, pronounced kind of like “zwoh-tih” and if you needed more proof about the language, there you go. The “cents” are called “groszy”. This is the most different coins I managed to collect at once, but even with this many, I’m missing the 1gr and 5gr. Why. So. Many. Coins. And look at that 5zl! It’s massive! History-filled – If you like history, Poland is the place for you. Well, probably all of Europe and the Middle East are good spots for you, but I knew nothing about Polish history before I went there, making everything I learned even more interesting. Just wait for my Polish history post… it’s fascinating. There are reminders like this all over the place, if you’re looking for them. 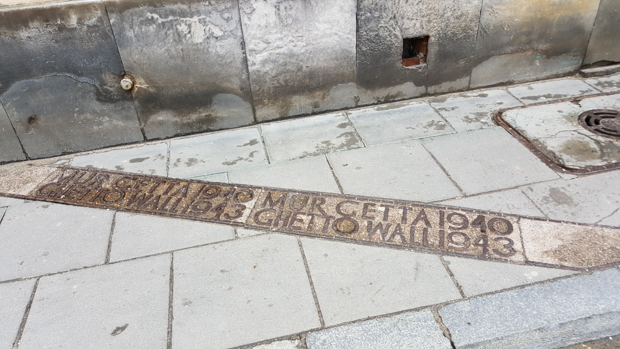 This line on the ground follows the footprint of the wall surrounding the Warsaw Jewish ghetto during WWII. Polish Pride – People are so proud to be Polish. It almost rivals Armenian pride and has a similar “we’re going to take credit for anyone and anything even almost kind of tangentially related to us” thing going on. They may not be thrilled with everything about Poland, but they are incredibly Polish proud. 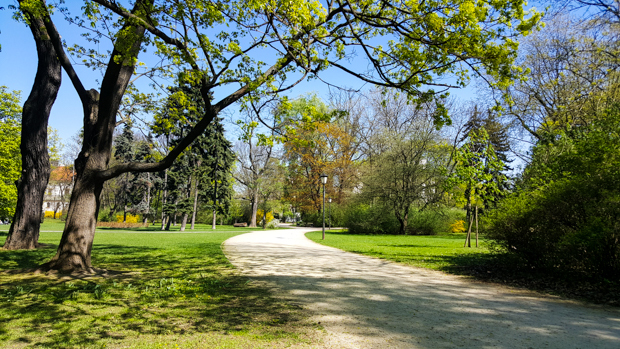 Underrated – Spoiler alert: I loved Poland. LOVED it. I don’t know that it’s a huge vacation destination, but it SHOULD be because it’s beautiful and interesting and I loved it and everyone else should too. Bike Lanes – Bike lanes exist, and people use them. And people who aren’t on bikes respect them. This is a completely foreign concept to me because bike lanes in the US turn into idling lanes, parking spots, good places to open a car door into, etc. Bikers are seen as a menace and an inconvenience. Not in Poland! We need to learn some lessons from Europe on sustainable transport! I spent most of my time in Poland walking around and thinking, “I could totally live here.” There are livable-feeling cities, and there are the ones that you visit and then feel happy to leave behind. I visited Warsaw and Krakow, and in both of them (Warsaw especially), I felt like I could easily settle in and stay for a while. It’s always nice to feel that level of comfort when you’re on the road! I thought this was awesome… in one of the parks in Warsaw, there’s a bouldering wall! There were a bunch of people rock climbing on it when I walked by. Before I launch into a tour of all the things I saw and did in Poland, I think it’s important to get some historical context. So, next time we talk, prepare yourself for a gripping Lara-style retelling of Polish history! It’s going to be fun, I promise.